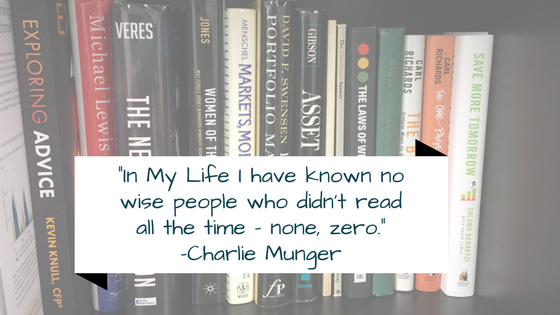 You might not know Charlie Munger, but you've certainly heard of his more famous business partner, Warren Buffett. Both men attribute much of their success to the countless hours they spend reading and learning. It's an attribute we try to emulate here at L.K. Benson & Company as we spend time each and every day keeping up with the latest financial news and research. Confirmation Bias: Why You Should Seek Out Disconfirming Evidence, By Shane Parrish - "Confirmation bias is our tendency to cherry pick information which confirms pre-existing beliefs or ideas." We've written about this concept before and while it applies to many areas of our daily lives, it can be especially prevalent when we look at our finances and how we handle them. This article provides a great primer on confirmation bias and how just being aware of it can help you overcome it. The Mental Mistakes We Make With Retirement Spending, By Meir Statman - We work with many clients making the transition into retirement. This transition can present many challenges and one that we often see clients struggle with, is getting mentally comfortable with spending down their portfolio after years of saving. This article does a good job framing this challenge and providing advice for anyone facing this transition. Show Clients Their Spending Habits, By Mitch Anthony - This article comes from a Financial Advisor publication, but it takes an interesting approach to a challenge we face with many clients - what are your expenses? We often use a client's tax return to get a sense of their cash flow expenditures and this takes a similar approach. The author proposes 4 categories of cash flow - owe, grow, give and live and provides suggestions for an easy way to look at what you are spending in each category. If you are struggling with your own budgeting or spending needs, this might help. The Evolution of the Four Pillars of Retirement Income Portfolios, By Michael Kitces - This is another article from a colleague and fellow financial planner that is directed towards advisors but is relevant for many of our clients. We've previously written about our total return approach to managing portfolios and handling withdrawals in retirement but we still see clients struggle with this concept in practice. This article discusses the four pillars of retirement income (Interest, Dividends, Capital Gains, Principal) and how you should think about using all four in retirement instead of taking an "income" approach. Whatever You Do, Don't Read This Column, By Jason Zweig - Similar to the way we seek out confirming evidence of our beliefs as outlined in the first article above, we are also very good at avoiding information that doesn't fit what we believe. Here, Jason looks at a recent survey of wealthy individuals and their unrealistic expectations for future market returns. Business Advice From a One Year Old, By Morgan Housel - You might not think a one year old can teach you anything you don't already know, but you'd be surprised. In this article, new father Morgan reflects back on his first year with his son and all the lessons he's taught him already. How Much Money Do You Need To Retire? By Ben Carlson - We get this question a lot and we have explained in the past the answer is usually "It depends". Sure, there are general rules of thumb, but the answer to this question is unique to every individual and depends on a variety of factors. Ben does a great job here explaining why that's the case and what else you need to be thinking about to really come up with an answer to the question. We hope you find these articles helpful and you enjoy the start to your summer!